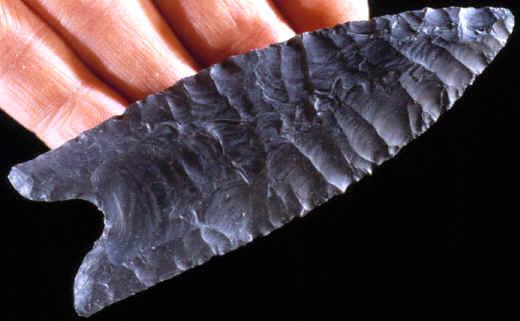 This Early Archaic Dalton point is one of a cache of 11 similar examples that were found several years ago on the olive Branch site in southern Illinois. They were all made of black chert that may be Pitkin chert. This Dalton point measures 3 5/8 inches long. Since 1986, archaeological excavations at the Olive Branch site at Thebes Gap in the bank on the Mississippi River have laid bare an important stratified sequence of archaeological deposits of the tenth millennium B.P. In terms of sheer quantity of artifacts, the Dalton occupation at Olive Branch is most important. A single radiocarbon date on charcoal from the upper Dalton zone is 9,200 to 9,100 years B.P.